At age 76, Jim Gentile now owns his rightful share of the 1961 RBI crown due to the work of some faithful researchers. No, the Orioles did not put Gentile in the way-back machine to have him add to his league-leading RBI total in 1961; however, SABR member Ron Rakowski discovered the official scorer of the July 5, 1961 game between the Indians and Yankees erroneously gave Roger Maris two RBIs instead of the one that he earned that day. Forty-nine years later the change has become official, much to Gentile's chagrin. Nineteen-sixty-one holds a special place for baseball fans, as Roger Maris made baseball history when he surpassed Babe Ruth's single-season home run record with 61 round-trippers. For Gentile, it earmarked a career year after toiling in the minor leagues. With six players hitting over 40 home runs that season, some fans speculated that the American League expansion caused his surge in power. Gentile strongly refutes that claim. Gentile had a long climb to the big leagues, starting out as a pitcher and first baseman in Class C Santa Barbara after signing with the Brooklyn Dodgers in 1952. He quickly discovered that there was a tremendous difference in having success as a pitcher in professional baseball compared to facing high school lineups. After a few seasons of leading his clubs in home runs and RBIs, Gentile thought that management would deem him worthy of a look in Brooklyn. He recalled a spirited exchange with general manager Buzzie Bavasi that was typical of an executive attempting to shuffle a crowded minor league system. The next season held tremendous significance for both Gentile and the New York baseball faithful. Nineteen-fifty-seven marked the last season that the Dodgers and Giants would call New York their home. For Gentile, it was the humble beginnings of a nine-year big league career. Gentile had another cup of coffee in 1958 with the newly minted Los Angeles Dodgers but didn't fare well in the cavernous Los Angeles Coliseum. By that point, he sensed that a change of scenery was imminent. The Dodgers almost granted his wish during the following spring training. He recounted an exchange with Bavasi that had him set to go to the Chicago White Sox until Bill Veeck pulled the plug at the final hour. 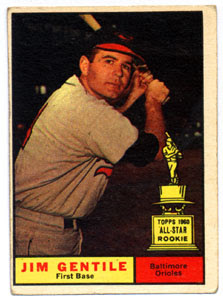 At the end of the 1959 season, Gentile finally was able to move on, via a trade to the Baltimore Orioles. This too wasn't without a hitch, which seemed to be a constant in Gentile's career until this point. Amidst all of the competition, Gentile got off to a slow start in spring training. He thought for sure that he was going back to the Dodgers. "He asked if I wanted to play for him, as long as there were no tantrums or tearing up clubhouses. I told him I'd play for him, but with eight years in the minors, I'm probably going to be labeled as a career minor leaguer. I'd play one year and then I'd like to try to go to Japan. For some reason, Paul Richards then calls me into his office and says, 'Son, you can't be as bad as you look. You have 208 home runs in seven years, with that power, I really need you on first base. You only have 36 times at bat in three years with the Dodgers. I'm going to give you 150 times at bat. On the 29th day, if you are hitting, you stay with me, if not, I'm going to send you back to the Dodgers.' Once the season started, things started to click." Gentile finished second in the Rookie of the Year voting to teammate Ron Hansen. Years removed his playing days, fans still call him “Diamond Jim,” the nickname Hall of Fame catcher Roy Campanella gave him. Gentile explained how the named followed him throughout his career. While Gentile is enjoying the revived interest in his career and his “new” record, the former All-Star is still trying to keep his place in the history books within the proper perspective.